At A Luxury View, you’ll get exactly what the name promises—and so much more! 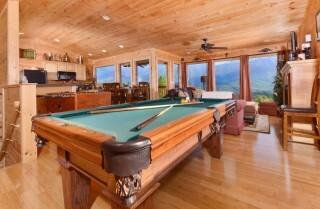 Located on a semi-private lot at the top of Webb Mountain (with an elevation of more than 2,000 feet! 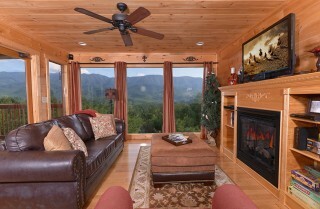 ), this romantic cabin for 2 overlooks the second highest point in the Great Smoky Mountains, Mount Guyot. Enjoy stunning views of this mountain in any season and from 3 deck spaces—2 covered areas and an open-air balcony with an outdoor hot tub. Inside A Luxury View, you’ll enjoy a spacious master bedroom with an electric fireplace and en suite bathroom along with open living spaces and a panoramic wall of windows. This “mountain chic” cabin is perfect for honeymooners or couples searching for a private Gatlinburg escape. 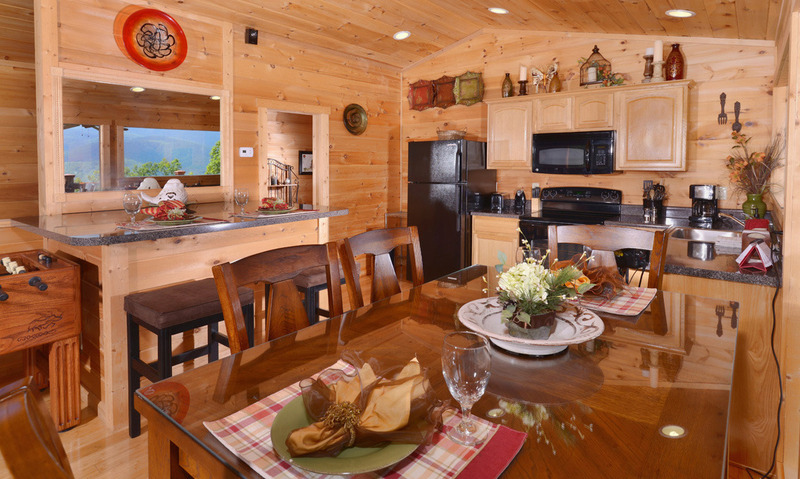 All you need to worry about is choosing the right Cabins for YOU Gift Basket to go with your romantic escape! 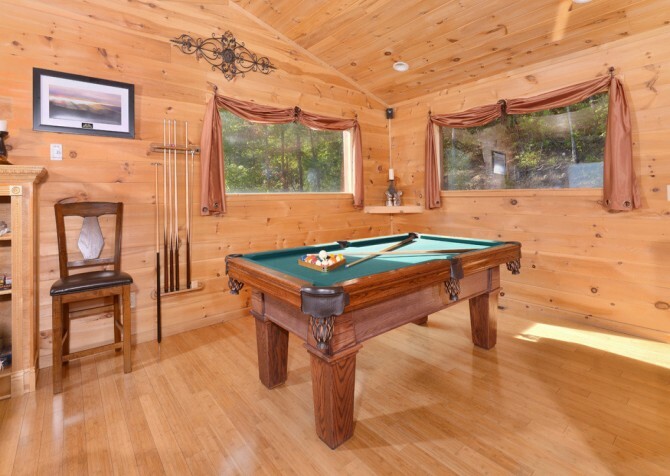 When it comes to entertainment, A Luxury View offers game tables inside the cabin along with access to community swimming pools, a golf course, and a tennis court inside the Cobbly Nob Resort. 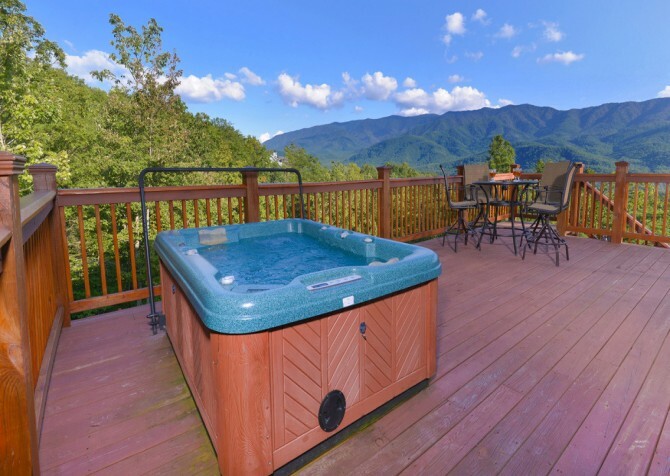 And you’ll be about 14 miles from downtown Gatlinburg when you’re ready for a celebratory steak dinner or a memorable date on the Parkway. 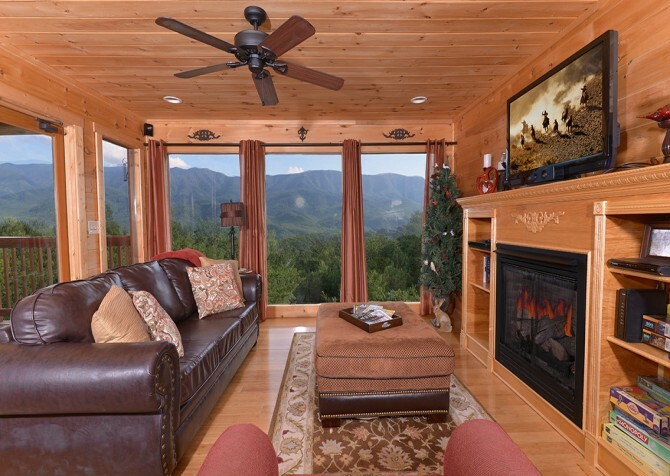 For luxury, privacy, entertainment, and unforgettable views, book this 1-bedroom, 1 ½-bath cabin that truly lives up to its name! 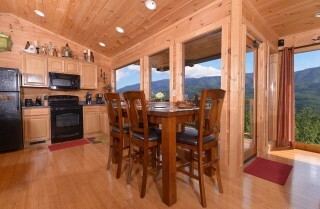 You won’t miss that “Luxury View” when you step inside this cabin thanks to the wall of windows across the back! With oversized panes that reach from floor to ceiling, you’ll have all-day access to stunning mountain views, and when the sun goes down, this cabin’s living room provides the perfect amenities to relax and unwind. 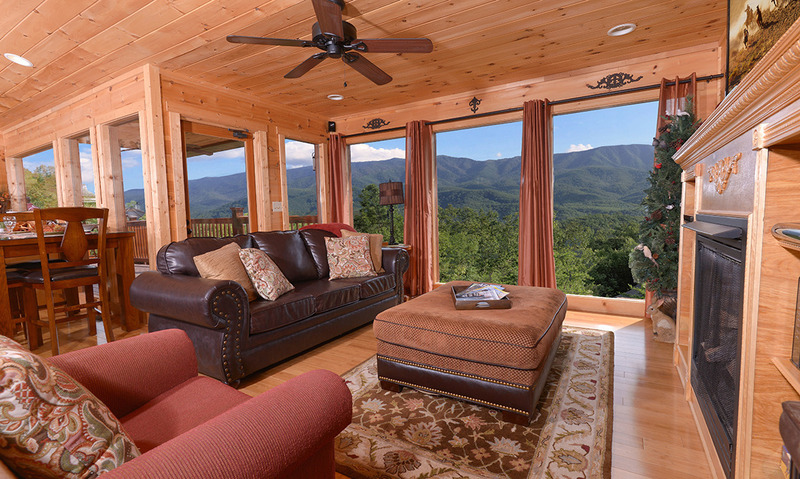 Sit back on the full-size leather couch or the plush chair provided by A Luxury View. 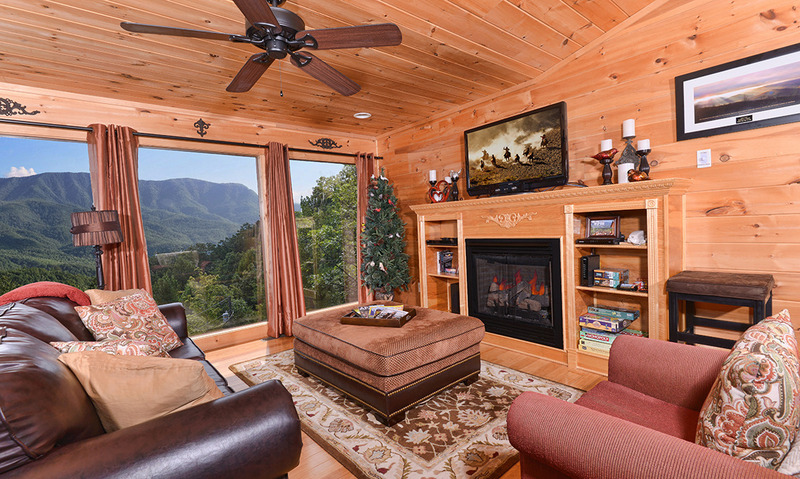 Then turn on a favorite movie using the 50-inch HD TV and DVD player, or simply enjoy a glass of Smoky Mountain wine in front of the romantic gas fireplace. This spacious living room is ideal for cuddling on the couch, playing board games into the night, or enjoying a much-needed in-cabin massage, which you can easily book through Cabins for YOU. 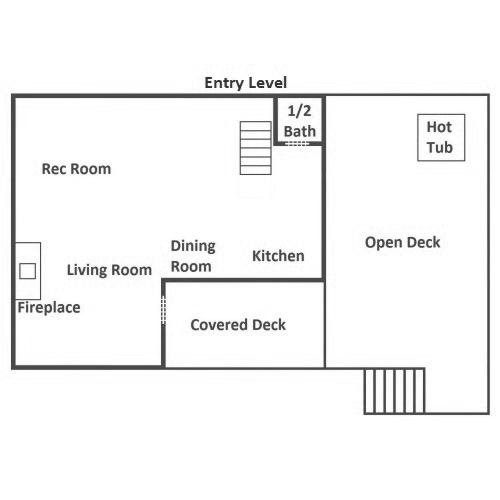 Other convenient extras inside this space include an oversized ottoman that doubles as a coffee table, a reading lamp and side table, and a ceiling fan. Staying in a Gatlinburg cabin doesn’t mean missing out on the essentials of home—especially when it comes to your cabin’s kitchen! Things like a full-size refrigerator, over-the-range microwave, oven, electric stove, and dishwasher are must-haves that A Luxury View happily provides. 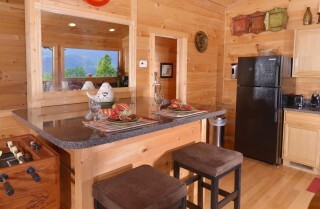 This cabin also comes with countertop appliances like a toaster, electric can opener, and coffeemaker. 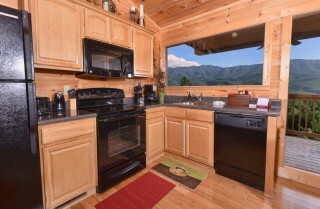 Even a gourmet cook can prep and serve his or her masterpieces out of this fully equipped kitchen! Stop by the Gatlinburg Farmers Market from May through October for the freshest ingredients around, and enjoy in-cabin meals with the one you love. Or if you’re celebrating a special occasion, add our Romantic Dinner for Two to your Gatlinburg stay. We’ll provide two 8-ounce rib-eyes along with all your sides and dessert. We even provide matches and charcoal for the grill, so all you need to do is grill the steaks to perfection and enjoy! Once your steaks are ready, sit down at the 4-piece dining table provided by A Luxury View. You can plan for private, romantic dinners at this table, which provides stunning views of the Smoky Mountains from several large windows. Trust us when we say you won’t find better views in any downtown restaurant! 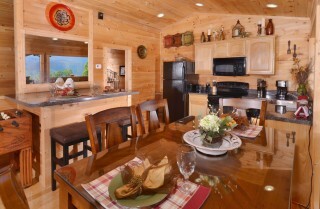 Other dining option provided by this cabin is a 4-piece patio set on the open-air balcony. If the weather is nice and you want to immerse yourself in the beauty of the Smokies, this is the place to be! 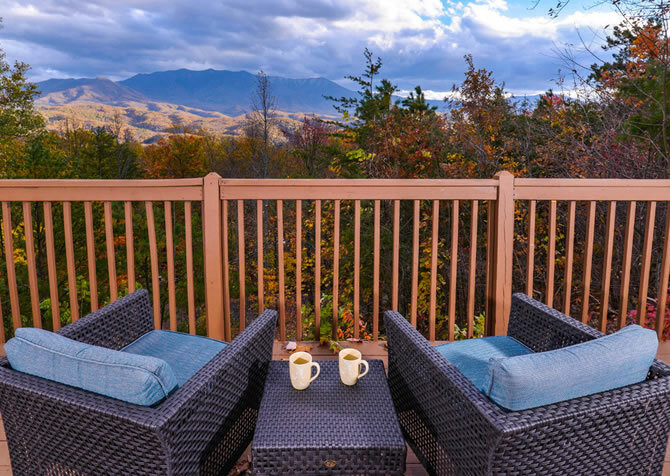 Enjoy coffee, a pancake breakfast, snacks, or even a game of cards with unforgettable scenery all around. Located on the main floor, adjacent to the living room, is A Luxury View’s game room with a full-size pool table and a foosball table nearby. 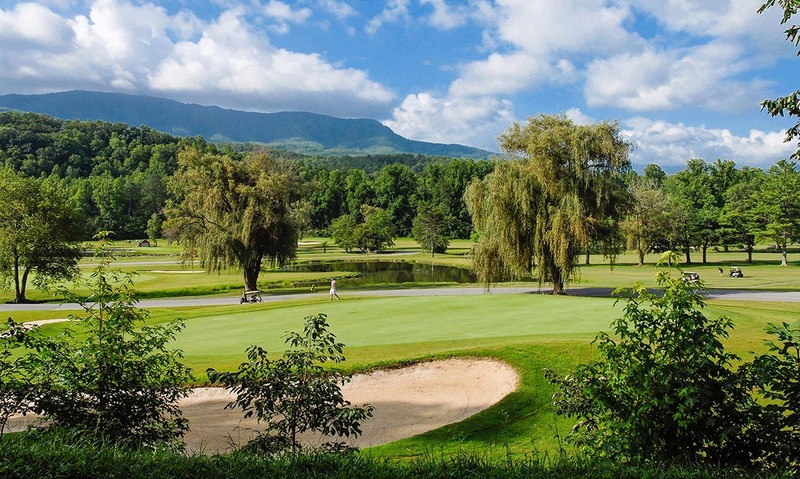 If you’re looking for some indoor entertainment late in the evening, or perhaps on a rainy day, you don’t have to drive all the way to downtown Gatlinburg to visit an arcade on the strip. Instead, A Luxury View provides these entertainment options, along with multiple TVs and DVD players and access to high speed wireless internet. 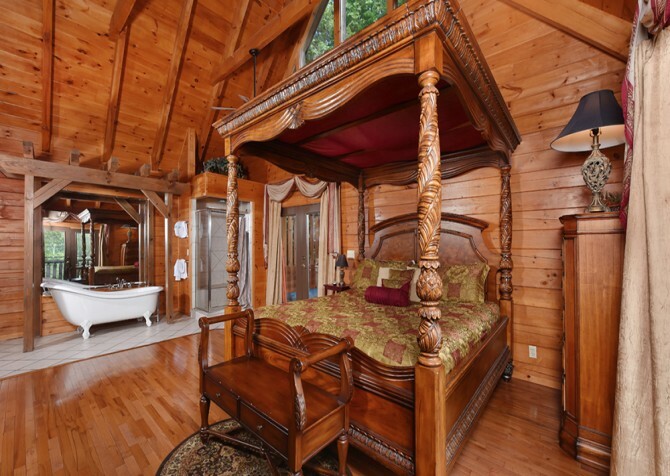 The master bedroom inside A Luxury View is your ultimate romantic retreat for honeymooners or vacationing couples. Enjoy large windows with mountain views, a king-size bed, an electric fireplace with beautiful stonework all around, and a flatscreen TV. This room also provides a comfy loveseat, twin nightstands and reading lamps, a dresser, and several wooden furniture pieces for storing your luggage. 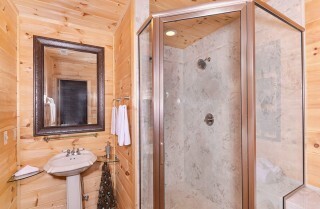 Attached to the master is an en suite bathroom complete with a large, his-and-hers marble shower and a spacious layout. 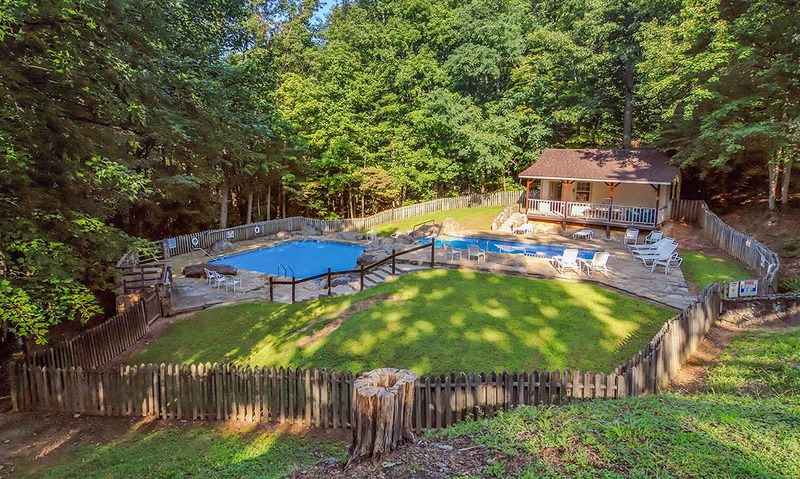 You’ll have plenty of space and feel truly pampered inside this luxurious retreat! For those traveling with kids or perhaps a couple friends, A Luxury View also provides a queen sleeper and a half-bath for your convenience. Total, you’ll be able to fit up to 4 guests inside this beautiful Gatlinburg cabin. When it comes to comes to enjoying your “Luxury View,” this cabin provides plenty of outdoor options, including two portions of covered deck and an open-air balcony. Downstairs, the covered deck features padded rocking chairs and an outdoor coffee table, perfect for a tray of snacks or a steaming mug of coffee on a cool mountain morning. 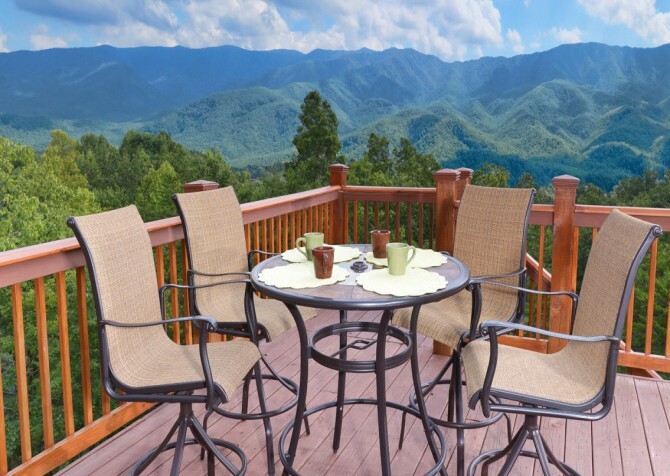 If you keep walking down the stairs, you’ll find a small patio with a 2-piece table conveniently located beside this cabin’s charcoal grill. 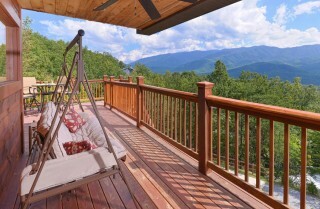 The upstairs deck features a covered area with an outdoor ceiling fan and swinging bench. And one of the best (outdoor) seats in the house is the open-air deck with a 4-piece patio set. You can take your meal out here on a nice day or plan for a relaxing soak in the outdoor hot tub also located on the deck. 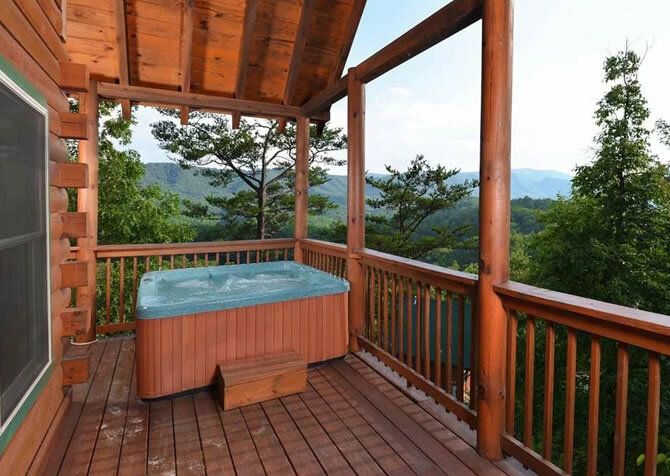 Talk about amazing views—you’ll be able to soak away your stress while soaking up the beauty of the Smokies! 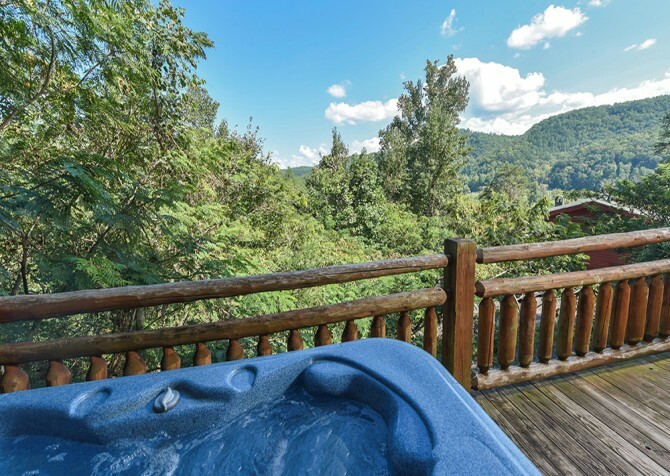 As part of the Cobbly Nob Resort, A Luxury View provides so much more than the list of amenities you’ll find inside the cabin. 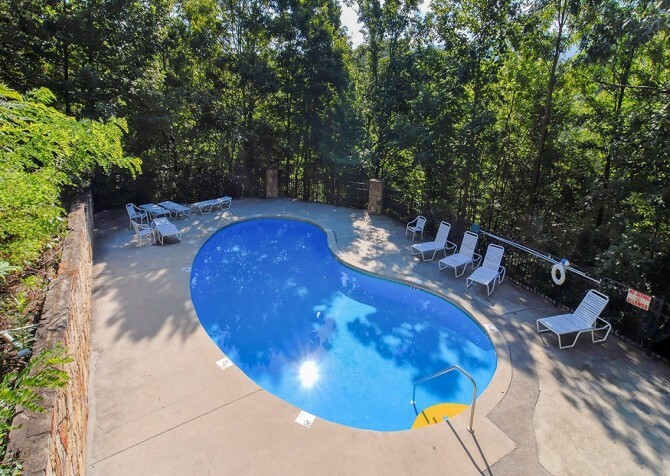 Other options for fun include 3 outdoor swimming pools and access to the Bent Creek Golf Course and a tennis court. So be sure to add to your packing list a bathing suit, your golf clubs, your tennis racket, and lots of sunscreen! 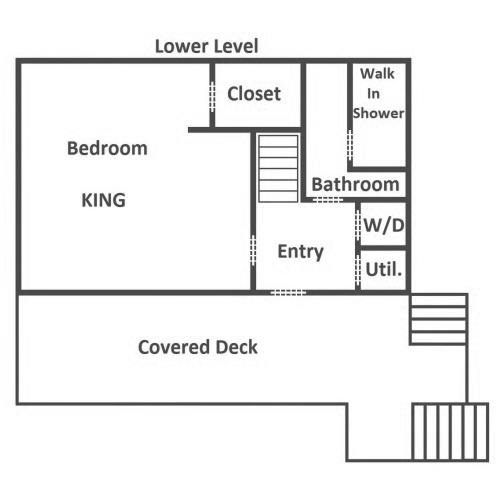 For your convenience, A Luxury View also provides access to a washer and dryer. Bring some detergent and fabric softener, and plan to wash a load or two before traveling back home. This will save you time later as you unpack from your Gatlinburg vacation and be a guaranteed stress-reducer as you get back in the swing of things when you arrive back home. It also has a paved driveway (but steep) and parking area, making arrivals that much easier! 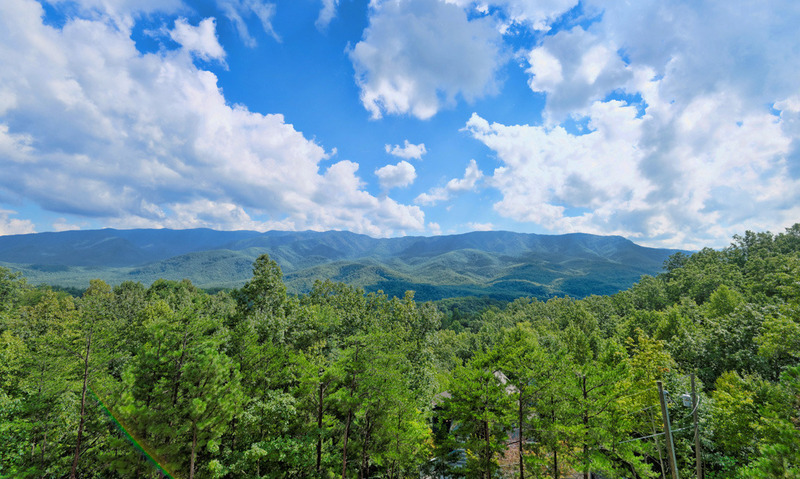 A classic Gatlinburg attraction, the Sky Lift runs directly over The Little Pigeon River, providing amazing views and a perfectly romantic photo op at the top! 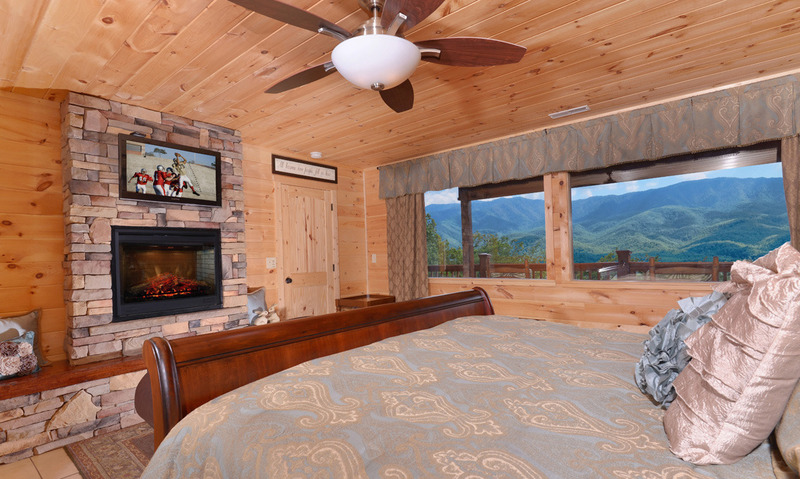 You already have amazing views at your Gatlinburg cabin, but here’s another Gatlinburg attraction that provides 360-degree views of the Smokies during the day and the downtown lights at night. Open year-round, the Ober Gatlinburg ice skating rink is a great way to beat the heat on a hot summer day and try something new with the one you love! "The driveway is a bit steep and really would require an AWD or 4x4 vehicle to have no issues making it up. Our 2014 durango spun the tires quite a few times everytime going up the drive." First, thank you for being a repeat guest! We appreciate your feedback on the driveway at A Luxury View. This kind of information helps our future guests a lot. We're so happy to hear you enjoyed your stay and the quality of your cabin, and we look forward to serving you again in the future. "Absolutely loved it!!! 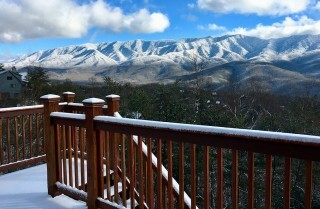 My husband and I stayed at A Luxury View Cabin. 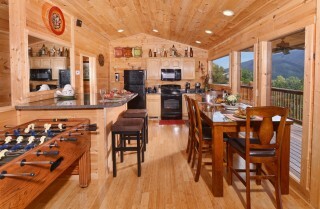 I cannot tell you how amazing this cabin was. So relaxing from the first day to the day we had to leave and come back home. We would definitely recommend this cabin. The views were breathtaking!!! We couldn't have asked for a better cabin." "Absolutely loved it!!' 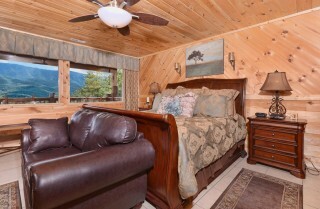 My husband and I recently stayed at the cabin A Luxury View. The views were Breathtaking!!! The mountains Majestic!!! So many special touches throughout the cabin that made you feel at home. 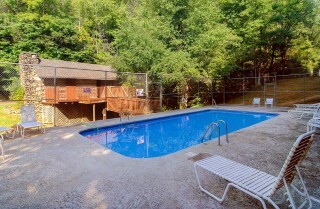 Staying at A Luxury View was so relaxing, quiet and private. I would definitely recommend this cabin."